It’s a busy time for Adam Levine. The Jewish musician, who is in an interfaith marriage with model Behati Prinsloo, is on baby watch. His wife is about to give birth to their second daughter, joining big sister Dusty Rose, 1. He’ll be back in his revolving chair February 26 with fellow coaches Blake Shelton, Alicia Keys and Kelly Clarkson when The Voice returns to NBC, and he’ll perform with Maroon 5 at the iHeartRadio Music Awards on March 11, where the band is nominated for Best Duo/Group of the Year. Tune in live at 8 p.m. ET/5 p.m. PT on TBS, TNT and TruTV. Daniel Day-Lewis and Timothée Chalamet, who are Academy Award nominees for Best Actor this year, have something else in common: Both are Jewish on their maternal side. A three-time Oscar winner (for My Left Foot, There Will Be Blood and Lincoln), Day-Lewis is nominated for Phantom Thread, and first-time nominee Chalamet, for Call Me By Your Name. The awards ceremony airs live on ABC March 4 at 8 p.m. ET/5 p.m. ET. In the thriller Beast of Burden, out February 23, Daniel Radcliffe plays a pilot who’s forced into smuggling drugs for a cocaine cartel. “I spend a lot of the film in the cockpit of a Cessna,” says the actor, who’ll star in the TBS sitcom Miracle Workers this spring. In the heaven-set comedy, he plays an angel who must prove to God (Steve Buscemi) that humanity is worth saving by answering a series of seemingly impossible prayers. 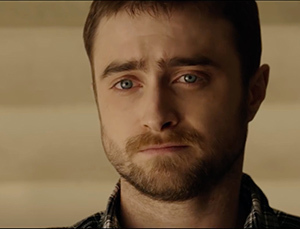 Radcliffe is Jewish on his mother’s side and Protestant on his father’s. In the best selling book The Year of Living Biblically, Jewish writer A.J. Jacobs wrote about his spiritual journey and quest to follow the Bible’s rules as literally as possible. Living Biblically, the CBS comedy series it inspired, has a Catholic main character named Chip (Jay R. Ferguson), but it retains a Jewish voice in the form of Rabbi Gil (David Krumholtz), one half of the “God Squad” Chip consults for guidance and advice. (Ian Gomez is the other half as Father Gene.) Krumholtz, who is Jewish, has many Jewish roles on his resumé with projects including Numb3rs, The Slums of Beverly Hills, The Santa Clause and The Deuce. “I’m proud to be Jewish, but I consider myself secular,” says Krumholtz, whose wife, actress Vanessa Britting, is not Jewish. Living Biblically, which premieres February 26, features Sara Gilbert (The Talk) in the recurring role of Chip’s co-worker Cheryl, “a crazy character, really weird and oddball,” she describes. She came aboard at the invitation of Johnny Galecki (The Big Bang Theory), who is a producer on the show and a friend since their youth on Roseanne, which has been revived for a debut on ABC March 27. Gilbert serves as one of the producers along with resuming her role as Darlene. Gilbert, who is Jewish, is in an interfaith marriage with musician Linda Perry. The arrival of an attractive young student from Australia (Emily Browning) disrupts the lives of two Brooklyn families when insecurities and jealousies arise in Golden Exits. She becomes uncomfortably close to two married men: the archivist she works for (Adam Horovitz) and a married music producer, who is also a family friend (Jason Schwartzman). Three of the cast members have interfaith backgrounds. Horovitz, a.k.a. Ad-Rock from the Beastie Boys, is the son of Jewish playwright Israel Horovitz, and Schwartzman’s late father was producer Jack Schwartzman. Both of their mothers are Catholic, Doris Keefe and actress Talia Shire, respectively. Lily Rabe, the daughter of Catholic playwright David Rabe, has Jewish roots on her mother’s side, specifically her maternal grandfather. Golden Exits opens February 9 in New York with select cities to follow. Congratulations to Haylie Duff, who is expecting her second child with her Jewish fiancé Matt Rosenberg. Mazel tov to Jewish Million Dollar Listing star Josh Flagg, and his new husband Bobby Boyd, who wed in a September ceremony that was recently featured on the Bravo show. “The wedding was magical, we danced the night away with all of our closest family and friends,” says Flagg. Best known for the teen sitcom Big Time Rush and Season 18 of Dancing With the Stars, in which he finished fourth, James Maslow is one of the houseguests on CBS’ Big Brother: Celebrity Edition, which launches February 7. Raised in his father’s Jewish faith (his mother is Catholic), he went to Hebrew school and became a bar mitzvah, and he went to Israel a few years ago on a Birthright Israel trip to reconnect with his Jewish roots.